Living Rivers September 2017 Funding Round - NOW OPEN! Melbourne Water’s Living Rivers program offers Councils funding, expertise and guidance to build understanding, skills and commitment for managing stormwater within an integrated water management approach. The last round of funding in February saw $1.49 million offered to 18 local councils for 24 projects. This round, approximately $1.5 million will be available to local governments for projects that improve the health of waterways and the bays and provide multiple benefit outcomes for local communities. This round will be open until Monday 9th October 2017, and applications must be made online. The Living Rivers Coordinators are available to discuss project ideas with council staff at any time. New Grant Application Guidelines have been launched with helpful tools such as a pre-application checklist to assist Councils in preparing grant applications. 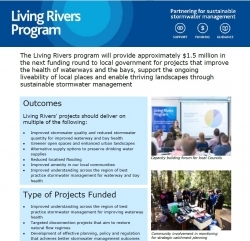 To access these resources and learn more about funding priorities, eligibility criteria, and case studies of projects previously funded through the Living Rivers Fund, please contact the team or visit the Living Rivers web page.